Screenshot from video (below) taken aboard the Skagen Maersk. There’s nothing structurally wrong with this vessel; if large ships like these–nearly a quarter of a mile long–weren’t designed to give way to pitching, rolling and yawing, they’d snap clear in half. Some vessels caught in high seas with heavy loads do break in half, like the MOL Comfort incident in 2013. The 2005-built MOL Comfort experienced “hogging”, or convex longitudinal deformations before her hull snapped amidship off Yemen in 2012. Photo: Marine Log. 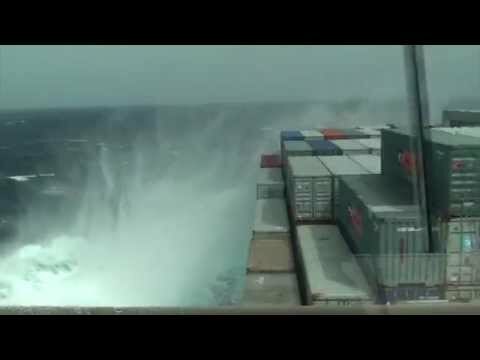 Watch video of the Skagen Maersk in high seas below, and read more about the vessel here.